In his January 14 letter, Gerry Downing informed us that the two main London bookshops selling leftwing journals, Housmans and Bookmarks, have refused to continue supplying Socialist Fight. This is a disgraceful capitulation to the witch-hunt aimed primarily at Jeremy Corbyn and the Labour left, whose main weapon has been the conflation of anti-Semitism with anti-Zionism (both shops have stated or implied that Socialist Fight is an “anti-Semitic” publication). This criticism applies particularly to Bookmarks, which is, of course, run by the Socialist Workers Party. SF recently adopted a ‘theory’ which claims that a central reason for imperialist support for Israel is the “overrepresentation” of Jews within the bourgeoisie (ie, there are ‘too many Jews’ at the top), and it is true that this idea is highly problematic. SF’s own conflation of anti-Semitism with anti-Zionism in this way was the reason Labour Against the Witchhunt voted to exclude it a year ago. But exclusion from a political campaign or faction is totally different from a refusal to sell a leftwing publication or engage with its politics in any way. LAW, of course, had a full debate with SF comrades before reaching its decision. The best way to defeat reactionary or mistaken ideas is to take them on and try to persuade those who express them why they are wrong, not attempt to suppress them. We urge both Bookmarks and Housmans to reconsider their decision. 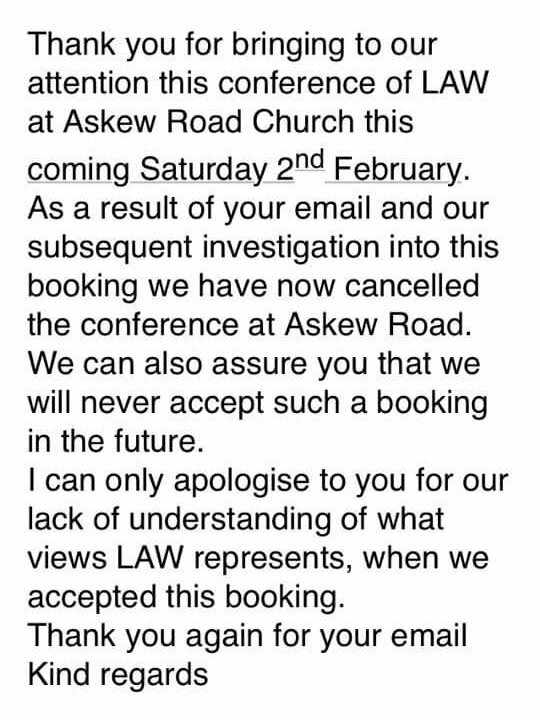 We are pleased to say that the cowards who have made malicious calls to our original conference venue have not been successful – our first conference will go ahead as planned tomorrow, but at an alternative venue. The ‘snow bomb’ shall not stop us either – it looks as most trains are running, more or less on time. Please come along to this important event to show that we will not be silenced in our ongoing campaign to fight the witch hunt in the Labour Party and wider society! If you have not received notification of tomorrow’s meeting point in central London, it means you are not a member of LAW. You can sign up tomorrow, but you need to get in touch with us to get notification of the meeting point. Call Stan on 07817 379568 or email info@labouragainstthewitchhunt.org. Conference is scheduled to last until 5pm. We recommend you take a packed lunch.